In millions of DIY shops across the globe, the one tool that is almost as essential as it is overlooked is the workbench. The myriad operations that require a piece to be held down, planed, chiseled, drilled, etc., all require a solid workbench to make these manipulations work well, accurately and safely. However, too many woodworkers don’t pay enough attention to their benches. Those that do are often overwhelmed by the choices available—the skill necessary to make a bench is pretty significant—and the choices of materials are even more daunting. A typical workbench made entirely of hardwood in the “old school” fashion can easily involve a price tag that includes a comma (or, if you’re in Europe, a space three numbers down on the left). Most home DIY’ers aren’t interested in that kind of financial commitment, but they still need a place to call their ‘woodworking home’. 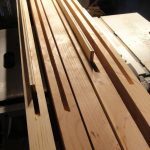 So what’s the balance between a workbench that requires you to sell your first born for the materials and one that works well enough for a novice home DIY’er to gain the experience needed to perhaps consider a traditional hardwood bench? A plywood top! Laminating three or four layers of plywood to create a dimensionally stable, rigid, heavy, robust and sturdy workbench top offers an economical alternative to purchasing several dozen (or even hundred) board feet of expensive beech, maple, oak, ash or other typical hardwood associated with workbench tops. However, one of the problems associated with laminating so many layers of plywood together is how to clamp them properly so they set perfectly. 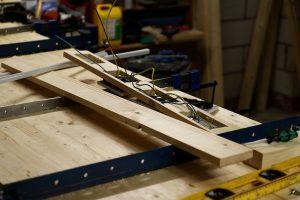 The construction of a workbench base is a little beyond the scope of this article—and there are literally hundreds of articles on how to build a workbench (both top and bottom). The focus here is how to build a top composed of three or four layers of plywood. Why plywood? Plywood offers so many positive attributes for a workshop workbench that it’s almost worth asking WHY NOT? Plywood won’t warp; it’s dimensionally stable and it also provides a lot of the necessary heft a workbench needs to remain stable when items on the top are being worked. The key to making a plywood top work is in how to fasten each layer to each other— drywall screws and a vat of wood glue will work perfectly to make this happen. The key is to make sure you have about six or eight clamps on hand so you can temporarily hold the layers together while you affix them together with screws as the glue sets up. Typical dimensions of a woodworking benchtop are approximately 24 x 72” (60 x 180 cm). Your dimensions may vary, of course—as you may have a shop with more or less space for your bench to occupy. The dimension of 24” is critical, however; this allows you to obtain at least two layers per sheet of plywood; plywood sheets in North America are often 48 x 96”. If money is no object, you can make your bench wider, the excess pieces can be put to good use for other projects. Cut the layers to the desired dimension and clamp the layers together (one at a time). Important note. Don’t use too many screws to attach the layers together! It doesn’t take that many to hold the layers together until the glue dries. Your workbench has holes for bench hooks, bench dogs and other holdfasts. Be careful that you don’t put screws into a place that you will put a vice, bench dog holes, a holdfast or some other adjustment to the top. It helps to make a drawing of the top and note the location of the screws used. When attaching the third (or fourth) layers to your benchtop, the only thing you have to worry about is accidentally overlapping screws from a previous layer. With this third (or fourth) layer firmly attached, you should now have an incredibly heavy workbench top that will contribute significantly to ensuring your bench doesn’t move when you’re working on it. Consider a plywood top! Economical, heavy, stable and with a coat of oil and very light paste wax—beautiful to boot!